This holiday season, San Francisco will be home to the world’s first pop-up department store. STOREROOM is the brainchild of CITIZEN:Citizen’s founder Philip Wood. STOREROOM is a temporary retail space offering the best in contemporary and luxury goods at storeroom prices. The two thousand sq.ft space has been converted into a department store with a storeroom aesthetic. The walls are adorned with industrial cardboard, and each brand is tagged with its name on the wall, creating a store in a store for each participating brand. Along with local bay are favorites Jimmyjane and Chronicle Books, STOREROOM will also be peddling unique and interesting items from Esque in Portland, STAACH in NY, and Walteria Living in LA. Other brands participating include Harveys, Areaware, Hulger, and ten others whose work will be arriving over the next few weeks. 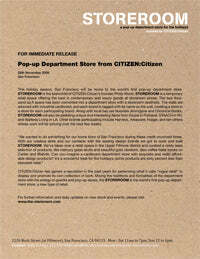 CITIZEN:Citizen has gained a reputation in the past years for performing what it calls “rogue retail” to display and promote its own collection of work. Mixing the traditions and formalities of the department store with the energy of guerilla and pop-up stores, the STOREROOM is the world’s first pop-up department store, a new type of retail. In an endeavour to keep the information flowing about the objects and projects we’re working on, we’ll be placing information and press releases here for all to view. Please take a read or download a PDF to take with you for delayed perusal.